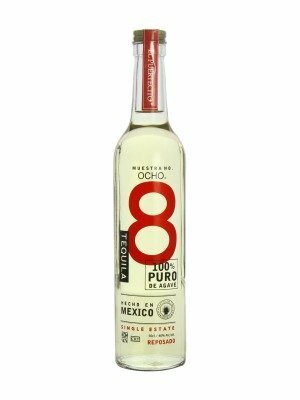 Ocho Reposado Mexican Rested Tequila is a popular Tequlia available from DrinkSupermarket.com in 50cl to buy online. Visit DrinkSupermarket.com for the best price for 50cl of Ocho Reposado Mexican Rested Tequila or compare prices on our other Tequlia products. The world's first single estate vintage tequila Aromas of evergreen mint, pine, oatmeal and dry hay combine with subtle flavours of oak and accents of brown sugar, orange, spice, cinnamon and white pepper. Nose: Delicate, soft and vanilla. Taste: Fine almond, vanilla with slight cinnamon notes. Hints of tapenade, vegetal. Very little evidence of oak or woodiness. Chewy, warm mouth-feel and a long subtle finish. Where to buy Ocho Reposado Mexican Rested Tequila ? Ocho Reposado Mexican Rested Tequila Supermarkets & Stockists. You can buy Ocho Reposado Mexican Rested Tequila online in most retailers and find it in the Tequlia aisle in supermarkets but we found the best deals online for Ocho Reposado Mexican Rested Tequila in DrinkSupermarket.com, Waitrose Cellar, and others. Compare the current price of Ocho Reposado Mexican Rested Tequila in 50cl size in the table of offers below. Simply click on the button to order Ocho Reposado Mexican Rested Tequila online now.